It's been a while, I've been doing a lot of Mage Knight repaints for my fantasy rpg I've been running, but I wanted to redo some of my old figures. I thought I would start with the skeletons and the zombies. This post is about the zombies. I used a shaker peg for the body, tile spacer feet and arms, round bead for the head, and used paper on some of the miniatures to create hair and torn clothing. I wasn't going to do any paper on these, I've been wanting to keep the monsters super simple so I can build a lot of them in a short period of time, but it just seemed to add a lot to the zombies to put hair and torn clothing on them and it's not that difficult since everything is supposed to look so haphazard. The three adventurers went into the room to sack it, but didn't realize that a magical alarm would sound upon their entering of the room, calling a bunch of zombies to come and attack the intruders! View if you are the thief trying to pry out the gem eyes of the idol. Closer up shot of the six new zombies. You can see more clearly the unkempt hair and torn clothing. In the future, I think I would do more of the ones that have their arms outstretched, they look the coolest. View from the other side. The one in the back has no paper on him at all. The others have paper hair, paper clothing (at least their shirts), or both. I think the paper adds a lot to the minis and it is not nearly as hard to do as it is on a character figure, where you have to make it look all symmetrical and such. Well, I finally made progress on something! The last time these made an appearance in the blog they were in the development stage. But I needed another Allied unit for an upcoming battle and these fit in well with the British that I already have. 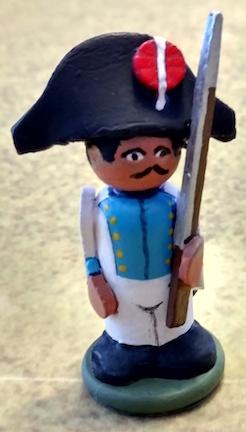 They are Napoleonic Spanish infantry in bicorne (1808). Spanish troops look pretty nice, even if they are usually rated rather poorly on the tabletop by most Napoleonic rules. They have almost Seven Years War style uniforms, reflecting a Revolutionary France influence of replacing the tricorne with the bicorne. This build is fairly similar to all my 42mm soldiers. It uses a standard 1 11/16" pawn for the head and body, with craft foam used for the arms, cartridge box, bicorne, and rosette. A small piece of square balsa dowel is used for the bayonet sheathe and the musket with fixed bayonet is a flat toothpick. As always, the feet are a wooden heart shape. It really does not get much simpler. One thing that is different about the arms and bicornes from previous experiments: I used a computer controlled cutting machine to make the parts, resulting in a quicker and more consistent product. I used some white dimensional paint to make the strap over the rosette on the bicorne and on top of the shoes, to make the feet more three-dimensional. Other than that, the rest is pen and paint. I decided to use a permanent marker with a brush tip for things like the eyebrows, mustache, and dark lines separating colors. I then used thick paint to edge right up to the pen lines in order to control the thickness. Unlike previously, I did not add painted muskets to the painted figure at the end; I glued them to the figure before I started painting. Big mistake. 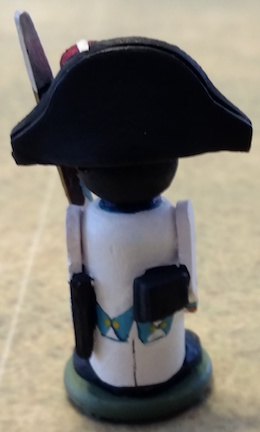 That made it harder to get paint on the back side of the musket without slopping over onto the white uniform or black bicorne. It is not so much that it looks bad – I doubt you can even see it unless you actively looked at a awkward angle – but that it plays on your mind when you are holding the figure close to your face at awkward angles. You notice it all the time, so the error looks much larger than it really is. In the end, though, I am pretty pleased with how they turned out. Sad it took me so long to finish them, but happy they are done.